In several cities across Northern Ireland, so-called “peace walls” mark the boundaries between Catholic and Protestant neighbourhoods. Erected amid the Troubles which started in the late 1960s, the barriers were intended as a temporary measure to prevent outbreaks of violence between the two communities. Yet since then, the peace walls have continued to grow in size and number, and 69% of those living closest to the walls believe they are still needed to protect civilians from conflict. Living near social frontiers such as the peace walls can have a huge negative impact on residents mental health and well-being. A recent study on the effect of segregation in Northern Ireland found that households living in an area divided by a peace wall were 19% more likely to be on antidepressants, and 39% more likely to be taking anti-anxiety medication. Clearly, Northern Ireland is an extreme example. But cities all over the world have social frontiers, where neighbouring areas display sharp differences in the religious beliefs of their residents. Differences such as ethnicity and class may also have an impact on frontier residents. For example, researchers from the USA recently discovered a link between social frontiers in ethnicity and low-level crime – they also found that more established frontiers were relatively peaceful. Social frontiers can be difficult to detect when there are no physical markers, such as the peace walls. And being able to identify where these frontiers lie is crucial to understanding the impacts on those living nearby. That’s why, with colleagues at the universities of Sheffield, Liverpool and Glasgow, I set out to develop a way of identifying social frontiers, which might otherwise be invisible. We came up with a method that distinguished between genuine frontiers and those that were just due to random variation. 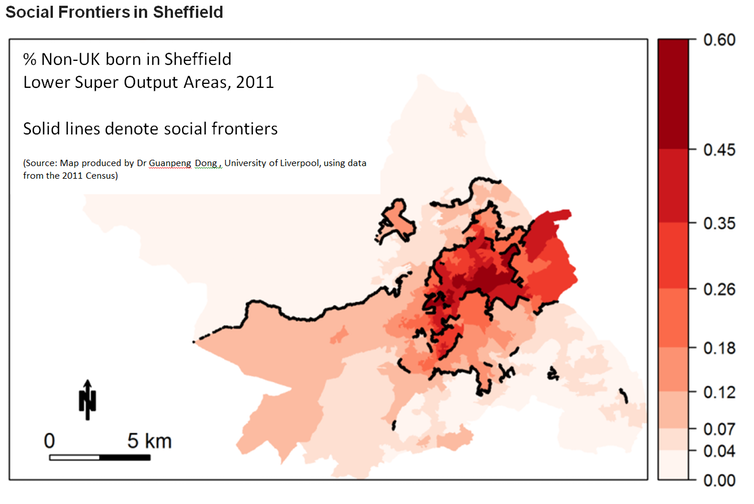 We then applied the method to neighbourhood differences in country of birth and ethnicity in Sheffield, and tested whether the identified social frontiers were linked to crime. We found that neighbourhoods joined by a social frontier had significantly higher rates of violent crime, burglaries, vehicle crimes and total crime. But we still don’t know why these social frontiers emerge and why they are associated with higher crime rates. One theory is that social frontiers are a symptom of underlying tensions between two communities. Such tensions mean that no one wants to live among members of the other group, so a kind of cliff edge emerges, where there are sharp differences in the make up of neighbourhoods, even though they are right next to each other. As such, both the social frontiers, and the related crimes, are symptoms of the social tensions. 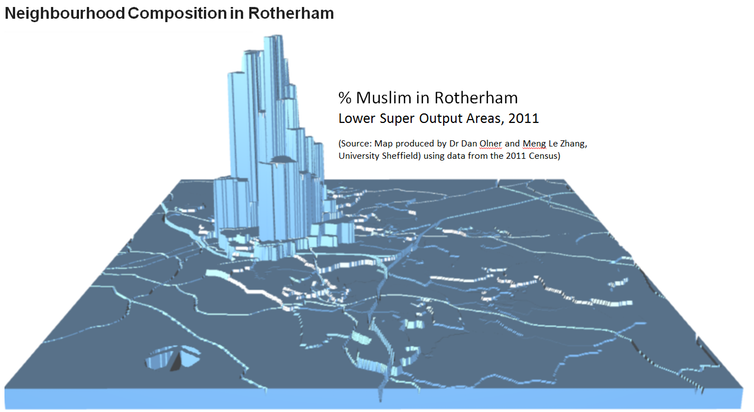 We have also visualised these cliff edges in the social landscape using 3D maps, such as the one below showing the percentage of Muslims in neighbourhoods in Rotherham, South Yorkshire. The highest share in any neighbourhood is around 42%. And although this is not particularly high compared to levels of ethnic concentration seen in other countries, such as the US, it’s large enough to wonder why there are far fewer Muslims living in neighbouring areas. A further issue with social frontiers, like the one we see here, is that there is a shortage of “bridge-builders” – households that are prepared to live in the other camp, providing vital links between otherwise isolated social networks. These bridge builders help avoid misunderstandings, and can help the two communities connect with each other and resolve points of conflict. Without them, tensions escalate and communities drift even further apart. It’s not yet clear whether frontiers are always sites of conflict, or whether they can also be places where diverse communities come together, or whether they are the results of arbitrary causes, such as local authority housing allocation decisions. We are also not sure how typical our results are of other UK cities, and whether higher crime rates are linked also to other inter-group divisions. For example, groups might become segregated out of fear for their own safety: research using large-scale nationally representative household survey data found that ethnic minorities living in neighbourhoods with a higher proportion of residents from their own ethnic group experienced lower levels of harassment and better mental health. Being able to identify social frontiers is the first step to understanding what impacts they have on the people living nearby. And if they are linked to crime, depression and anxiety in other cities too, then governments will have good cause to set about dismantling the invisible frontiers that divide society.